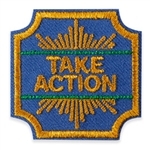 Girl Scout AmbassadorJustice Award Patch. Iron-on embroidered patch with the word "Sage" and "GS" inside a sage leaf. 1 7/8" x 1 1/2". Imported. Iron-on embroidered patch with gold, metallic border and the words "Dream Maker". Imported. Iron-on Patch. The Take Action Award is earned as part of the new Outdoors Journey. Girls must complete a Take Action project relevant to what they've learned on their Journey and earn the Journey Award plus the Take Action award when finished. The requirements to earn this Journey are exclusively on the Volunteer Toolkit. All Leaders should have access to this via their MyGS community on GSEWNI.org. If you have trouble accessing the Volunteer Toolkit, please contact the council for assistance. Girls explore the ways programmers solve problems though activities and games designed to teach them to Think Like a Programmer! Girls learn how to Think Like an Engineer through hands-on building and design challenges. Stylish keepsake bracelet made of wooden beads and a silvertone charm reading "Justice". This bracelet goes along with the Ambassador Journey book Justice and is a fun keepsake for girls who complete the Journey. Girl Scout Ambassador Journey Award Advocate Pin. With butterfly design, aquamarine color faceted glass stone and "GS" and "Advocate". Earned Award.